The best gluten-free recipes are designed that way from the start: no modifications or substitutions required. 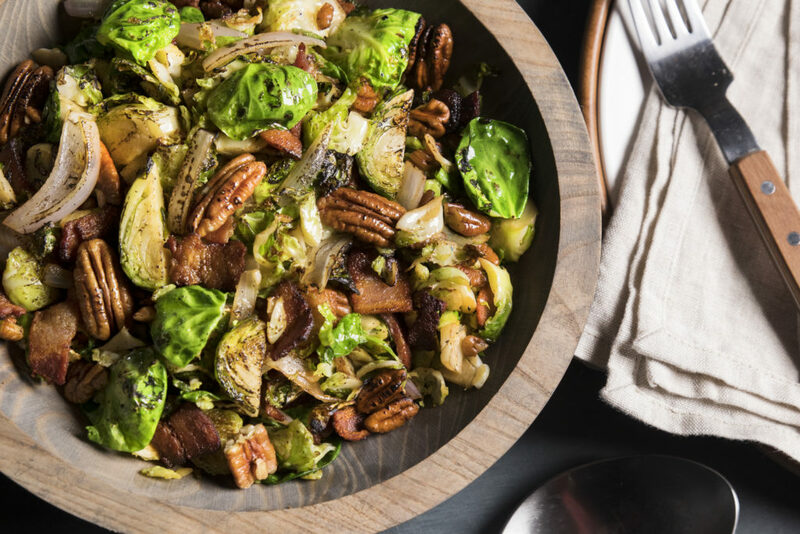 This Brussels sprout side is just one of many deliciously meant-to-be-gluten-free recipes from Green Chef, which now offers three certified gluten-free meal plans. Enjoy these crisp, tender, nutty, and savory sautéed sprouts. Medium-dice bacon into about ½-inch pieces. Place bacon in a dry medium-sized sauté pan over medium heat. Cook 2 minutes, stirring occasionally. Add pecans. Cook 8-10 minutes, or until pecans are toasted and bacon is crispy, stirring occasionally. Transfer bacon and pecans to a paper towel (keep bacon fat in pan). Cut ends off Brussels sprouts. Lay flat and cut into about ¼-inch-thick slices. Cut ends off shallot and remove peel. Halve lengthwise. Lay flat and cut lengthwise into about ¼-inch thick strips. Return pan with bacon fat to stovetop over medium heat. Add Brussels sprouts and shallot to hot pan. Season with salt and pepper. Cook 7-10 minutes, or until veggies are crisp-tender, stirring occasionally. Add about ¼ cup water to pan with Brussels sprouts. Stir. Cook 2-3 minutes, or until water cooks off and veggies are tender, stirring occasionally. Remove from heat. Return bacon and pecans to pan. Salt and pepper to taste. Stir to combine.